Belgian, with chocolate chips, apple butter…however you like them, waffles are a breakfast staple. In fact, it’s a near perfect breakfast food that can be dressed up, or down, made sweet, or savory, and can even be made into a sandwich. Yep, you read that right. For a delicious variety of waffles, check out these 10 spots in New Mexico! This locally owned, family diner serves up warm, steaming waffles straight-up or mixed with everything from pecans, strawberries, apples and cinnamon and raisins. Deep pocketed Belgian waffles come with fruit and a large dollop of whipped cream. Thick and warm syrup served on the side. Ask for blueberry syrup for a sweet treat. The magic here begins with made-from-scratch batters—wheat and buttermilk, blue corn and buttermilk, buckwheat and sour cream, rye and sour cream, multigrain and milk and rice and—and then cooked in French-made Belgian waffle irons. The results are melt-in-your-mouth good. Choose a sweet or savory waffle or a build-your-own that captures both taste sensations. Gluten free and vegan options available. What is a Liege waffle? Try one here and it will be the benchmark for all waffles to come. It’s richer, denser and sweeter than traditional waffles. There are some delicious combinations, but the Menage a Trio combines all of the great flavors: three-cream lemon mousse, Bavarian cream, whipped cream, bananas, chocolate ganache and caramelized almonds. Enough for one … or three. From Sunday through Thursday, the dinner special to get here is a waffle served with crunchy fried chicken. Only the best local, wild and farm fresh ingredients are used at this family-owned farm-to-table eatery. The chicken comes with a spicy hot sauce. That combined with the maple syrup served with the waffle makes for a sweet and spicy sophisticated meal. A waffle here is breakfast, dinner and dessert all rolled into one meal. It begins with a homemade buttermilk and chives fluffy waffle that’s topped with fried chicken thighs, drizzled with a spicy maple syrup then topped with a HOT green chile apple slaw. A delicious and satisfying meal that will last you all day. Sometimes you feel like a smoothie and sometimes you feel like a waffle, or so say the owners of this specialty cafe. Both are on the menu. The waffles are the Belgian kind … thick and full of nooks and crannies … and come in a variety of combinations from Smores to the Filbert to the Nutty Banana. These are artisan crafted waffles that taste as good as they look. A little cabin in the woods with a stream running by and an outdoor deck is the perfect setting for warm and luscious waffles. 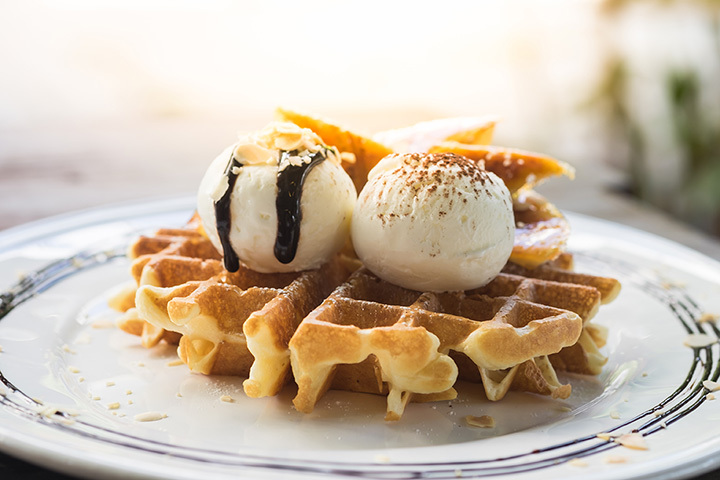 On the menu here are two pearl sugar-studded Belgian waffles served with a chilled Bavarian cream and either chocolate sauce or maple syrup. If it’s warm, sit on the patio and enjoy the fresh mountain air. You can’t beat home-style southern food with a New Mexican flair. What’s not to like about a cornbread waffle topped with fried chicken? Nothing! Even better is a cornbread waffle with cracklings or bacon in it topped with honey pecan fried chicken. And for dessert? A sweet cinnamon topped treat. Add a handcrafted beer and the meal is complete. A chain, yes, but a family friendly one that serves homestyle American classics like waffles with a twist . Belgian style. The one on the menu comes with one fresh egg, two hickory smoked bacon strips or sausage links and either strawberry, blackberry or sugar-free maple syrup. It’s just a good, honest breakfast. It may say pancake in the name, but this restaurant is known for its waffles, too. When it was voted “Best Breakfast in Grant County,” the Belgian and traditional waffles helped seal the deal. There are a bunch to choose from. Served with fruit, topped with bacon or pecans or as a sandwich stuffed with egg, bacon or sausage, it’s a meal that kick starts any day.